Here is a more detailed presentation of the four Assistants ad Providentiam who were elected on Friday, November 4, 2016. 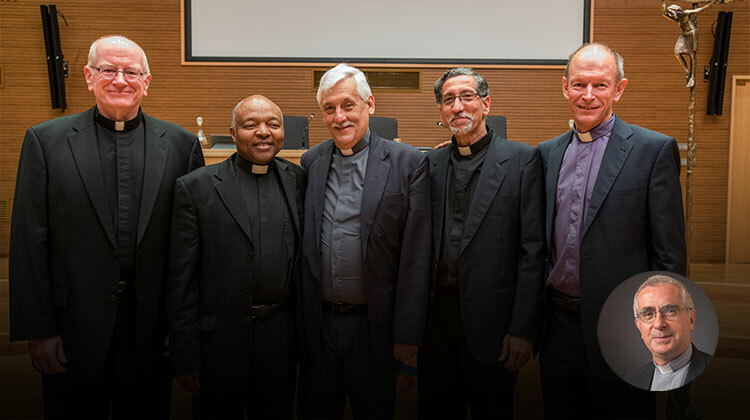 The four are among the General Counsellors that Father General appointed to his council last week. Fr. Vernon D’Cunha comes from the Province of Bombay (BOM). He was born in Mumbai, India, in 1956. He entered the Society on July 30, 1977 and made his final vows on December 8, 1994. He is the current Provincial of Bombay Province. Fr. Douglas Marcouiller comes from US Central-Southern Province (UCS). He was born in 1953 in Evanston, United States. He entered the Society on August 22, 1978. He made his final vows on September 17, 2005. He is currently the Regional Assistant for Canada and USA. Fr. Marcouiller has also been elected as Father General’s admonitor. Fr. Fratern Masawe comes from Eastern Africa Province (AOR). He was born in 1956 in the United Republic of Tanzania. He entered the Society on July 4, 1978, and made his final vows on December 8, 1996. He is currently the Regional Assistant for Africa. Fr. John Dardis comes from Ireland Province (HIB). He was born in Dublin in 1956. He entered the Society on November 23, 1974. He made his last vows on October 9, 1998. In addition to the election of the four Assistants ad Providentiam and the Admonitor, Father General also announced that he was appointing Father Antoine Kerhuel as Secretary of the Society. Father comes from the Province of France (GAL). He was born in 1957 in Lorient, France, and entered the Society on October 5, 1981. He made his final vows on September 5, 1998. He is the current Regional Assistant of West Europe. In his first letter to the entire Society dated November 4, 2016, Father General Arturo Sosa announced that he hopes to begin working with the new team in the early days of January 2017. Finally, Father Sosa expressed gratitude on behalf of the Society to the men who will soon be leaving the central government of the Society for new assignments elsewhere. These are Fathers Miguel Cruzado, Ignacio Echarte, James E. Grummer, and Federico Lombardi. Their dedication, generosity and availability have been helpful to the Society.